Those investing in equity markets must be aware of the market mantra – that large-cap stocks yield lower returns than mid-cap counters. Mid-cap companies are emerging companies with ability to grow faster than their larger counterparts through their niche and unique offerings. Though, above is just a generalized statement and cannot be precisely applicable for all mid-cap and large-cap companies but only fast emerging mid-cap companies. Yet again, we also have small-cap companies which have the potential to grow at a lightning fast speed on their low base as compared to larger mid-cap companies. Such small cap companies tend to out-perform in the best of the times such as bullish market conditions. But there is a downside as well – These small-cap-high-return stocks also come with huge risk. In fact, we can provide the same sort of categorization with respect to the various different economies of the world in terms of the size and potential of the growth of the economies, they could be termed as ‘Developed’ markets, ‘Developing / Emerging’ markets and ‘Frontier Markets’. Most of us must be aware about developed and large economies like US, Europe and UK. Even emerging market economies is no alien term for fast growing economies like India, China, Brazil and Russia (commonly coined as BRIC nations). However, according to a report, many wealthy Indians are betting on the more risky and lesser known ‘frontier markets’ in search for even higher returns. Such frontier markets include economies of nations like Nigeria, Sri Lanka, Kuwait, Ukraine, Kenya and Vietnam among others. 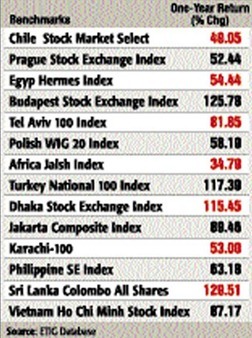 Some of these Frontier Markets like Turkey, Bangladesh and Sri-Lanka have provided over 110% returns over past one year outpacing all other developed & Emerging markets. Further, the report also says that these markets have been largely ignored by a wider section of global investors because they consider them to be of higher risk. The investors are warming up to such frontier markets as emerging markets like China and India have done exceedingly well over the past one year. The frontier markets with good fundamentals and relatively cheaper valuations may now play a catch up with these larger economies, during the next 1 year, while the over-heated emerging markets look to consolidate their position. Thus, frontier markets could well prove to be a destination for high risk investors who wish to participate in the fast paced growth of the lesser known economies like Kenya, Ukraine and Vietnam among others. The potential to invest in frontier markets can be termed as catching the high growth economies ‘young’ in their initial stage of growth and investment cycle in the bid to get the best deal for the initial investors through their first mover advantage. iPad – Reviewers go ga-ga over it !